Philadelphia is one of 48 counties that will receive extra resources and funding to combat HIV, according to the Trump administration’s plan to eliminate transmission of the virus by 2030. According to an outline published by the Department of Health and Human Services, the plan — announced during President Donald Trump’s State of the Union address — will target “hotspots” across the country that accounted for more than 50 percent of new HIV diagnoses in 2016 and 2017. Those include Philadelphia, as well as Washington, D.C.; San Juan, Puerto Rico; and seven states with high rural HIV rates, including Alabama, Mississippi, and Arkansas. Philadelphia has the highest HIV infection rate in the state and one of the highest in the country. According to the Centers for Disease Control and Prevention, of 108 metropolitan areas, the Philadelphia-Camden-Wilmington area ranks 33rd in terms of highest HIV infection rates. Nearly 70 percent of those diagnosed in Philadelphia are black. Statewide, nearly half the people living with HIV in 2017 were black. The president’s plan would increase funding for efforts such as the Ryan White HIV/AIDS Program to provide medical care in low-income communities, though the administration has not said how much money it would ask Congress to appropriate. That information will appear in his budget proposal, which comes out next month. The government also would fund an “HIV HealthForce” in identified hotspots to oversee and implement programs to diagnose, treat, and prevent the disease. The outline published by Health and Human Services highlights expanding the use of pre-exposure prophylaxis, or PrEP, a once-a-day pill that prevents HIV infection. But Tom Farley, Philadelphia’s public health commissioner, isn’t impressed. He said Philadelphia is already doing much of what the plan outlines — funding programs and outreach efforts to reduce the incidence of HIV. Of those living in the city with HIV, 90 percent have been diagnosed and 85 percent have been linked with care. A little more than half of those patients are virally suppressed, meaning medication has reduced their viral load to such low levels that the virus is nearly undetectable and is no longer sexually transmitted. Still, barriers to care exist, particularly among minority populations, where the disease is spreading most rapidly. In 2017, Latinx and black Philadelphians were diagnosed with HIV at approximately four to five times the rate of whites. 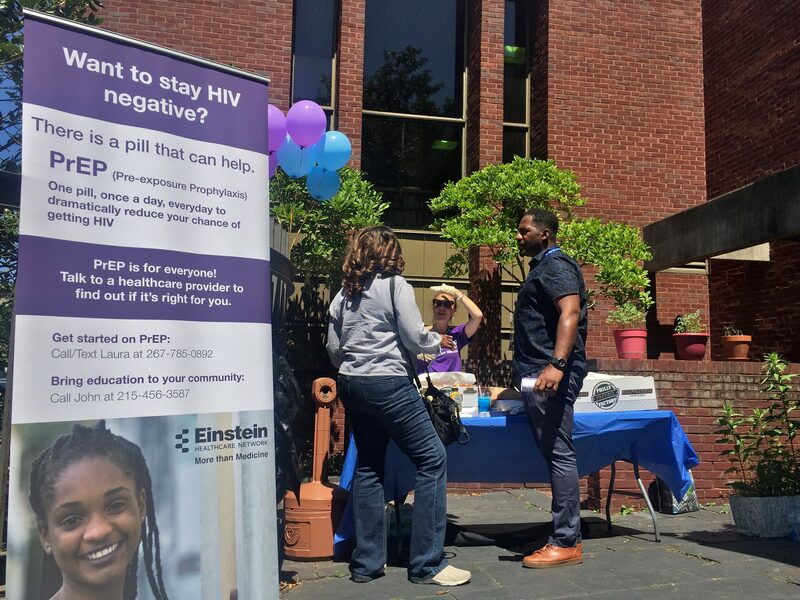 “Larger systemic inequalities and social determinants of health are really what stand in the way to ending HIV,” said Aviva Joffe, HIV program director at Einstein Healthcare Network. If the Trump administration wants to reach its goal of reducing HIV transmission by 75 percent in five years and effectively eliminating the virus over the next decade, Joffe said, it will take more than treatment and prevention programs. Gary Bell, executive director of Bebashi, an HIV/AIDS organization in Philadelphia that serves mostly low-income minorities, agreed, saying the administration also needs to focus on issues such as affordable housing, unemployment, and food insecurity. In fact, the Trump administration has cut many programs designed to address social factors related to HIV. Funding for the Ryan White program was cut 2 percent to 3 percent in 2017. Support for the federal Housing Opportunities for Persons with AIDS program, which provides housing assistance and other services for those living with HIV, was cut that year as well. There is currently a waitlist for the housing program’s services, and no new housing vouchers will be distributed until further notice. Bell said those changes along with other policy choices, particularly those affecting the transgender community, breed distrust in the administration’s desire to tackle the ambitious goal of eliminating HIV. Farley, the city’s public health commissioner, pointed to the Trump administration’s position on the Affordable Care Act as another way in which attempts to halt the spread of HIV could be foiled. Still, many groups, while wary of some of the administration’s other policies, welcome the renewed focus on HIV. “Even though this administration has said things and put policies in place where they have been directly harmful to communities, many organizations think it’s important that we’re still at the table,” said Raniyah Copeland, president and CEO of the Black AIDS Institute in Los Angeles. Einstein’s Joffe agreed but said the goal of ending new infections in 10 years may be out of reach if the administration doesn’t support more robust comprehensive policies.